As the name suggests, Pulse Wireless Active Earphones are manufactured for those who demand performance in their active lifestyle. With its highly innovative, convertible design, Pulse can be used with or without its provided stable-fit neckband. 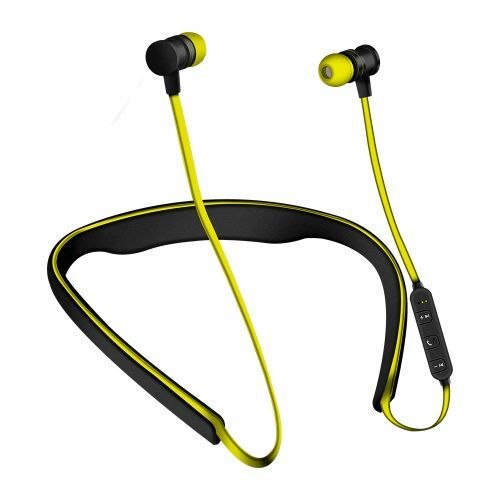 Its sweat resistant finishing and magnetic earbuds make Pulse the practical choice for active workouts. Pulse combines high-def sound with clear treble and bass, matching its performance to its functionality. An inbuilt mic and remote gives you wireless control over music and calls. Pulse Wireless Active Earphones come in three trendy color combinations of black with blue, red and yellow. Experience high-definition sound, clear treble and bass with Pulse. An inbuilt mic and remote gives you wireless control over music and calls. Perfect for active workouts with its featured convertible design, Pulse can be used with or without its provided neckband.